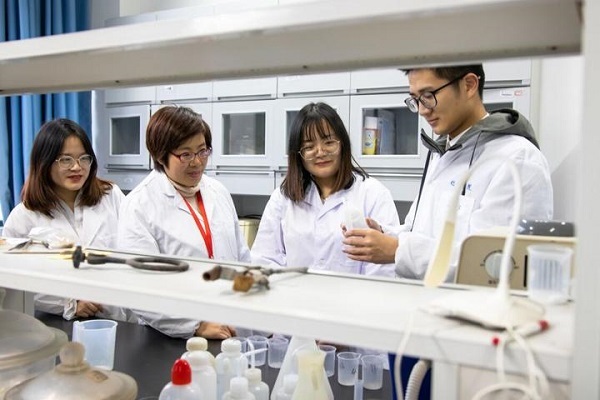 The student team of the College of Chemistry and Materials Engineering of Wenzhou University has developed a new type of LED lighting, using high-color light source with high color rendering and low color temperature to create a comfortable warm white light. Nowadays, the white LEDs used in streetlights and landscape lighting are constructed by coating yellow phosphors on blue semiconductor chips, but the white light synthesized by this method lacks red light in the spectrum, making the color temperature higher than 6000K. The color rendering index is lower than 70, showing a cool white light. When the light illuminates the object, the color of the object is distorted, giving a cool texture. In addition, the main patents of commercial nitride red powder are controlled by European and American countries, and the domestic market is dominated by foreign companies, which makes China’s LED R&D and production subject to a certain degree of restriction. In response to the current problem of white LED cold white light, the student team prepared a series of Mn4+ doped fluoride luminescent materials with independent intellectual property rights, which can absorb the blue light emitted by white LED chips and emit red light. By improving the synthesis process, the luminous efficiency is improved and the microstructure of the material is optimized. Moreover, the material is free of rare earth and can be synthesized in air, which is advantageous for industrialization. Compared with the existing commercial nitride LED lamps on the market, the new LEDs have independent intellectual property rights. The products designed by the team are now mastered 17 Chinese invention patents. The domestic LED lamps can be independently produced and sold, breaking the red phosphors. Export restrictions. At present, the product has entered the small test stage in relevant enterprises. The LED tube and product performance test data of the enterprise show that the fluorescent red powder synthesized by the team can effectively compensate the red light component in the commercial yellow-blue two-color white LED. The color index has been significantly improved, which can meet high-end lighting such as medical, museum, and shopping malls, and achieve competition with European and American countries.